Today, we're going to a luau themed party for Pj's annual company picnic so I thought it would be fun to look at some lovely tiki style outfits and accessories for your next luau or summery day. Pictured above are the sarong style wiggle dress and Paradise Cove halter swing dress both currently on sale for almost 50% off. Key elements of tiki style are carved details and bold colors like the turquoise stretch skull bead bracelet carved tiki shoes in black and fabulous Plumeria "Retrolite" earrings from Classic Hardware. 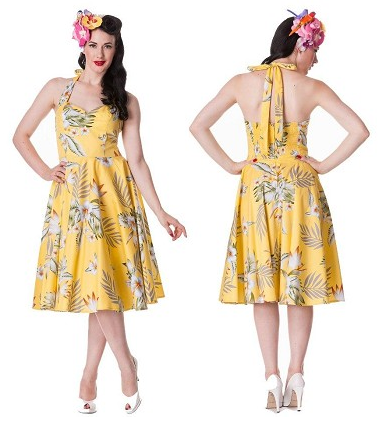 I love the understated print on this Hell Bunny Alika Tiki Dress in yellow. Some tiki prints, while fun can be very over-the top but this dress could be worn as-is or toned down with a neutral cardigan. On our honeymoon in Florida, Pj bought me a killer pair of carved wedges, much like these leather carved tiki heels in camel from Pleaser .They're so striking, they get compliments everywhere that I wear them. These camel heels are currently on sale! 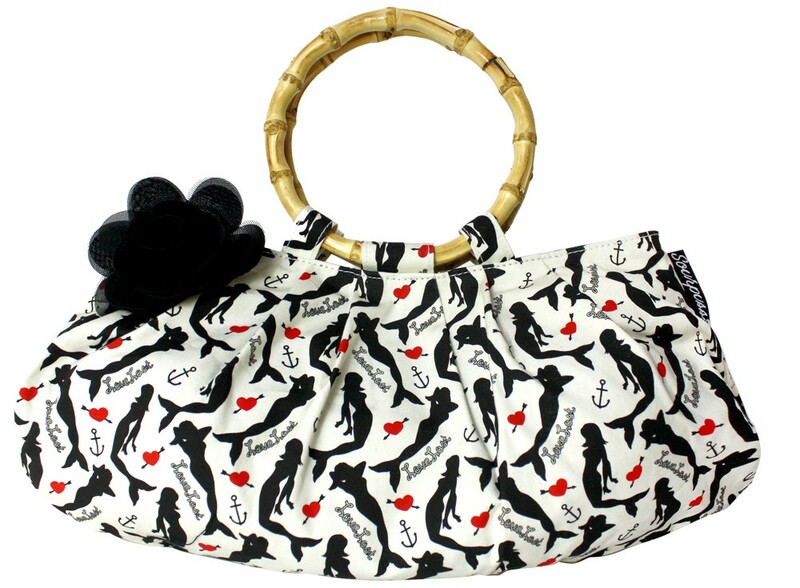 My favorite tiki accessory from the bunch is the Lost love purse from Sourpuss Clothing with bamboo handle and nautical mermaid print. I love this segment, when you highlight steals of the week. I have been eyeing that Hell Bunny for awhile now. It's the perfect tiki dress!